Women's Original Short Rain Boots is rated 4.6 out of 5 by 538. Perfecta para los días de lluvia, esta bota de agua para mujer es una versión más baja de la clásica bota alta de Hunter Original. Elaborada con caucho natural, cada bota se confecciona y monta de manera artesanal durante tres días antes de someterse al proceso de vulcanizado para ofrecer una mayor protección. 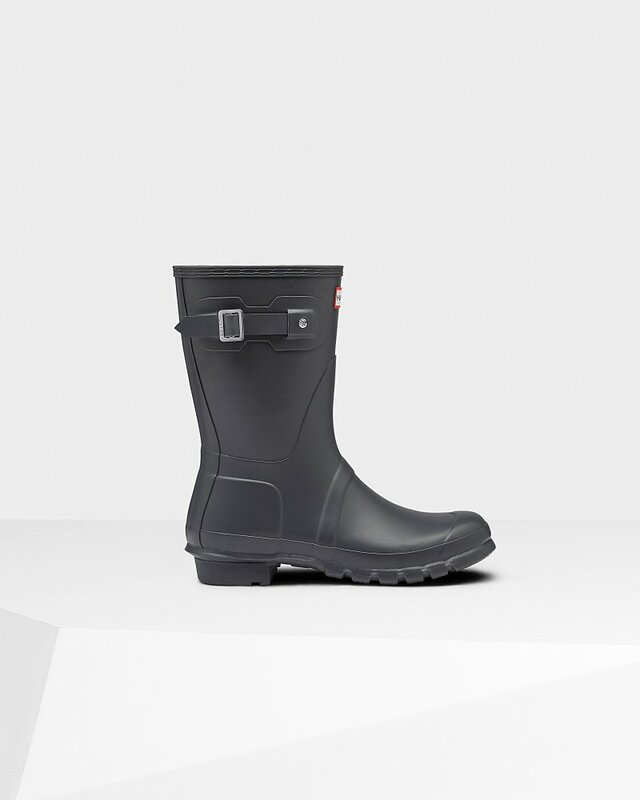 Con el dibujo de Hunter Original y un cómodo forro de poliéster, esta bota impermeable de color gris pizarra es un accesorio imprescindible para los días de lluvia. Rated 1 out of 5 by Sophia from Cute boots-- miserable quality Recently purchased this and after only a few wears, the material is cracking and peeling horribly. I have all the website suggested cleaning products, but this issue cannot be "cleaned" off -- it seems to be a flaw with the actual rubber. Very disappointed! I think it might be because they are matte -- I also own a pair of glossy yellow boots and they have held up great over the years. Rated 5 out of 5 by MistyH from Comfortable and cute! Exchanged my tall boots for short to get a better fit. Customer service was great! Quick and very helpful. Love my new boots! Rated 5 out of 5 by jules from Comfy & Cute i bought these about a month ago and i wear them constantly, they’re the only boots i can wear around campus through any weather. obsessed with them. Rated 5 out of 5 by lexi from Great build. Great look. Well Worth it. I bought these boots 3 weeks ago and I have worn them every day since! I needed a stylish boot to hold up in the snow/rain/slush of Vermont and these boots do just that while matching every outfit! I couldn’t be happier with them. Rated 5 out of 5 by Deli90 from Very comfy and amazing quality I got these earlier this month for an early birthday present for myself and I kid you not I’ve wore them since the minute I got them. I lived in Michigan and for that weather of snow and rain they were perfect. Now I’m moving to Georgia and i I’ll be country living and these will be perfect there too! I’m going going to be ordering another pair for myself and my girls very soon they aren’t worth every penny. Rated 2 out of 5 by Tffany031189 from Pretty, but Uncomfortable!!! Bought these because I had always like the look of them, but I wore them for one hour and couldn't take the pain any longer. The worst boot ever. Such a waste of money. Rated 5 out of 5 by Lori from Love these with the shirpa insoles. Hands down favorite boot. I love them. They wear great with the shirpa insoles. I now have to have them in light pink. Rated 5 out of 5 by Patti from Great features I had to exchange my boots for a bigger size- it was easy and quick!